Bach Collegium Japan was first noticed internationally for undertaking the huge project of recording the complete church cantatas of J. S. Bach. Although the ensemble’s discography consists of predominately vocal works, the participating instrumentalists have attracted acclaim ever since the outset. On the present offering, it is Bach’s two great sets of orchestral works that form the programme and the choir of the BCJ is silent. 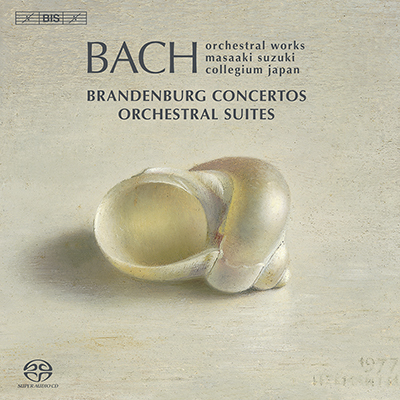 Bach Collegium Japan and Masaaki Suzuki first recorded the Brandenburg Concertos in 2000, but now return to these great works. The new recording took place in the recently completed MUZA Kawasaki Hall, a venue that is highly suitable to an approach focussing on the chamber music qualities of this music. In four of the concertos Masaaki Suzuki has chosen to replace the traditional cello with the violoncello da spalla – a smaller instrument played horizontally on the shoulder or held against the breast. The instrument has already featured in the BCJ Cantata series, and opens for new possibilities in timbre, for instance in Concerto No. 6, where the violoncello da spalla blends particularly well with the two solo violas and the viola da gambas.